Bishop Alan’s Blog: Birds of a feather? ASBO Jesus frequently hits interesting nails on the head with cartoons such as this morning’s. I've been reading Bill Bishop’s book The Big Sort: How the clustering of like-minded America is tearing us apart. This shows the devastating effect on social cohesion of gated communities in many areas of American life. But this is not just a sociological problem; it’s a missional issue. What hapens when we do Church like this? Well, I suppose, we are saying that we believe we can only do our Christianity with real people if we get the option to pick the kinds of people they are. And that doesn’t include all the people whose homes we drive by on our way to Church. Drive-In Church seems ludicrous, but this is Drive-by Church. We proclaim the reconciliation of heaven and earth by the power that raised Jesus from the dead working in us, but then hedge that process about with an insistence that we get a veto over who’s on the bus. If we believe we need to be like this, we’ve pretty much made it happen anyway. Doesn’t make it true, though. Thank God he doesn’t take that attitude. Wow- I am with you on this. I understand the motivation (I have 2 kids and no workable weekly worship/discipleship activity for them at present)- but it always depresses me slightly when I hear of friends moving to a new area saying that they have been driving around looking for a 'good church'. I wonder did this start with the church 3 miles drive away. One of the problems with "relevant" liturgy is that it breaks into these little camps. One begins to see the sense of our ancestors in providing a liturgy to which all were expected to adapt. But even that can be exclusionary. 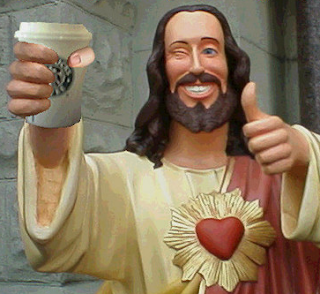 Buddy Christ hawks Starbucks! Dude! Awesome! So I guess 'Doing it 3D: Daily Drive-in Devotionals' is not your choice for best 'Fresh Expression' in the next Church Times? What doesn't tickle my sense of humor is the church-shopping. I agree 100% on that. The CC (DOC) is a small but diverse denomination. But what attracted me was the instruction to 'not leave my brain at the door'. I engaged in a big way, especially when my church became Open and Affirming, supporting the rights of gay people to live and love whom they please, and also to have full civil rights. My heart hurts after yesterday's ruling in California re: gay marriage but I know that my church, and all of us, will keep on working for our brothers' and sisters' civil rights. We also gathered last November when Prop 8 was passed and wept in the sanctuary as we agonized together. Those are my people there, all diverse yet everyone brings so much to our church life. Excluding that diversity makes us poor in spirit. That's only part of what describes my church. Yet I've had people visit who say they like it because 'it looks like a church!' Really. They don't want to hear the Jesus stuff, the mission stuff, the social justice stuff, or study responsibly. I sense that even as they join us, if something 'better' comes up as they shop, they'll be gone. It's disturbing to us of a certain age and above, the lack of commitment, the emphasis on outside and what it can do for me vs. the inside (heart) and what it can do for us. Many thanks to all. It's particularly good to get a fix on this drive-in Church itself... The bigger question for me is whether we're in this for us, as a feelgood thing, or even as therapy. Jesus calls us to give up our lives, and become disciples. It's something like the difference between a demo and a full app. The full app actually costs! At some point in the Christian life what we're in it for has to give up its place to a less self-centred, more God-centred attitude.